Spring has sprung! Or at least is springing. Regarding the previous post highlighting the USDA zone map, it's worth mentioning that Sunset Magazine's Sunset Climate Zones maps are much more precise than the USDA zone map that was linked to. I prefer Sunset's over USDA's for western gardens. To simplify things for that article, the USDA map was featured. I just returned from a week long trip out of state to be greeted by very warm weather and the first Monarch caterpillar sitings! Very early this year as compared to the previous. Last year (the first for the Container Butterfly Garden), caterpillars weren't spotted until well into April/May. One good thing about this warm weather is that the garden plants are literally bursting forth out of their proverbial knickers! I attribute that to the warmth and good timing of liquid fertilizer the garden received prior to my vacation departure. Tropical Milkweed is the attractor ace here, whilst the other species have yet to reveal themselves as caterpillar hosts up to this point. One way to maintain and increase your butterfly plant stock is to start cuttings, and now is a good time to sprout some in our SoCal area. Most plants can be propagated via leaf and stem cuttings. Others can be increased through root and rhizome division. One super easy plant to start by cuttings is Tropical Milkweed, Asclepias curassavica. I start cuttings in sterilized propagating soil and containers nestled under clear covers using a heating mat and grow lights indoors. For many species of plants, propagation doesn't require using all of the equipment mentioned above. The video below illustrates how a grade school-era propagation technique can easily supply your garden with an abundance of butterfly fodder for a pittance, forgoing getting all geeky as Yours Truly does with the lights and the heating mat and the benches and the soils and the containers and the trays and the covers and the foods... Oy vey! A couple of things to add to Tony's cutting video, would be to change out the water regularly, as you don't want it going bad, ruining your success at rooting cuttings. If handy, use distilled or RO water instead of tap water. Bad juju in tap water; that's why the bottled water industry is so big. Also, I'm averse to stripping off unwanted leaves, as I believe nipping or clipping them off is safer. There are times when I prepared cuttings by pulling leaves, only to rip off part of the cambium layer attached to the leaf. Your mileage may vary. Several species of milkweed growing in the Container Butterfly Garden are increasing themselves by casting their seeds to the wind. Many float down into plant containers where the fertile potting soil and necessary moisture are conducive to successful germination. Waiting until I believe they are large enough to transplant into their own containers, they are removed by gently cutting out a plug of soil around a seedling, making sure a goodly amount of the seedling's roots are included, lifting the plug out with a spoon or something similar, and then back filling the hole in the parent pot with fresh potting mix. Those of you who have milkweed growing in your gardens may wish to let some of your Tropical Milkweed seed pods mature and disperse, later to find tiny surprises popping up helter skelter that can be left in place or dug up and moved to more desirable garden spots. Or you can collect the seeds, lightly rub off the parachute fluff between your palms, and plant them in a container of good potting soil. Easy peasy to germinate. Heck, you could even share some of them when large enough with neophytes or like-minded folks! Another idea: those living in Laguna Beach could raise some milkweed and then donate them to the Alta Laguna Park Butterfly Garden c/o "AC" Anthony Condon, Parks Gardener for Alta Laguna Park. 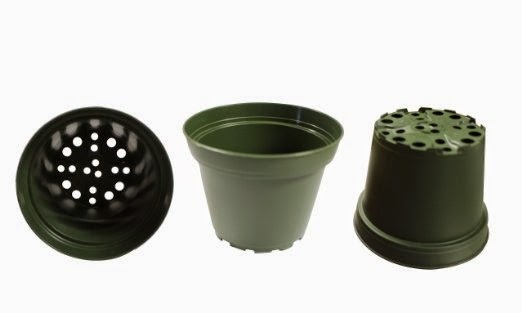 Acquire a suitable container to start seeds in. Something with holes at the bottom to allow excess water to drain out of, and something that is not too deep. Nurseries and big box do-it-yourself stores sell 'em for dirt cheap. An 8 inch diameter shallow pot will accommodate close to a dozen seedlings up until transplanting time. Soak seeds in warm water for 24 hours before planting. Not absolutely necessary, but it does aide in faster germination. Fill container(s) with a good grade of potting soil. tamp down soil firmly but lightly, not too compact. Leave about a two inch clearance from the lip of the pot to the top of the potting mix. Dampen soil thoroughly and let drain. Place seeds about an inch apart on top of the firmed, dampened soil. Lightly cover seeds with about a 1/4 inch to 1/2 inch of potting soil. Tamp lightly so as not to disturb seeds. No need to re water. Optional: cover pot with plastic wrap secured with a large rubber band. Poke a few holes in it to allow a bit of air flow to minimize potential fungal growth. Place somewhere that is warm and sunny. Be careful though, you don't want to cook the poor little buggers! They should germinate anywhere between 7 to 14 days, depending upon how warm it is. Keep the plastic wrap on until the seedlings barely touch it. Remove the wrap. Keep soil damp, not wet. Wet soils promote disease and can cause root rot. When the seedling grow to be about 4-6 inches in height, it's time to individually transplant them into larger containers or directly in the ground. They may wilt a little bit at first from transplant shock, but Tropical Milkweed is rather hardy and should bounce back within a few days. Once they've acclimatized themselves to their new surroundings, feed them with a half strength solution of liquid fertilizer. After that, fertilize them on a monthly basis in order to get them to a good size fast for our butterflies to feast on.